Obama’s Libya debate answer: He’s exploiting patriotism, just like Bush. Democrats are using patriotism to drown out criticism of the president, just like George W. Bush. Last night, in a confrontation over Libya, President Obama beat the stuffing out of Mitt Romney. Liberals are ecstatic. They shouldn’t be. 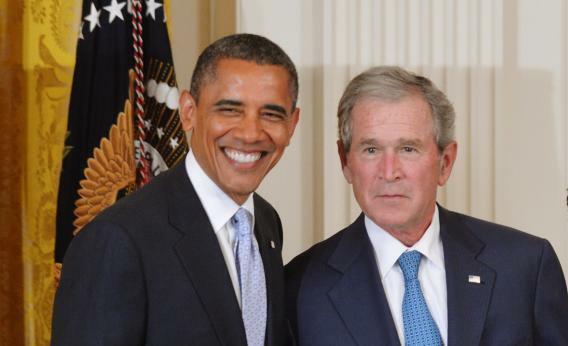 Obama’s response to the Libya question was a carbon copy of George W. Bush’s response to questions about Iraq in 2004. Democrats have learned the cynical art of turning patriotism against dissent. In 2004, Bush used the same ploys. He milked the symbolism of flags, coffins, and Andrews Air Force Base. To paper over his failures as a manager, he ran as a warrior and avenger. He vouched for his own reliability. He substituted confidence for evidence, resolve for judgment. He argued that he was clear and honest, even if you disagreed with him. He used indignation and emotional appeals to drown out questions. When critics dissented, he accused them of dividing the country and undermining national security. It became so clear to the American people how Gov. Romney and the campaign continue to try to politicize a tragedy. … The president was clear: We are going to get to the bottom of this. The whole world will know it. And I think when the president turned and looked at Gov. Romney and made that assertion, saying, basically, “Don’t question me on this, in terms of my caring,” I thought it was a powerful moment. Congratulations, liberals. You’ve learned Bush’s methods well. They’re great for winning elections. They’re just bad for governing wisely and holding presidents accountable. And now they’re yours.